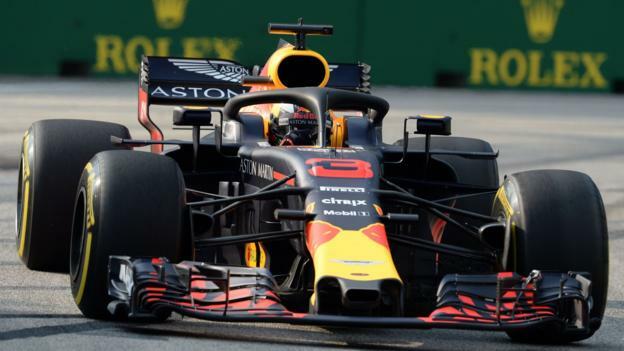 Daniel Ricciardo led Max Verstappen to a Red Bull one-two in first practice at the Singapore Grand Prix. Title leader Lewis Hamilton was only sixth quickest, 1.521 seconds off the pace, and 1.235secs behind title rival Sebastian Vettel’s Ferrari in third. Hamilton is 30 points ahead of Vettel and is expecting a difficult weekend on a track that does not suit Mercedes. The session ended with Kimi Raikkonen’s Ferrari replacement Charles Leclerc crashing his Sauber into a wall. Hamilton did not use the fastest type of tyres and dropped down from first position as others did runs on them. He had been fastest in the first part of the session, while he was using the ultra-soft tyres, the middle of three compounds available this weekend. But as the Red Bulls and Ferraris switched to the quickest hyper-softs, Mercedes changed to the soft tyre – the hardest and slowest of the three over one lap – and concentrated on runs with a heavier fuel load. There were a number of spins and off-track moments as drivers familiarised themselves with the twisty and bumpy Marina Bay street circuit. Hamilton ran wide, his team-mate Valtteri Bottas had a spin at Turn Two, as did Williams’ Lance Stroll, and Force India’s Sergio Perez spun at Turn 20. But the only crash was by new Ferrari signing Leclerc, who misjudged his exit from the Anderson Bridge and clipped the wall of the right-hand kink before the tight left-hander at Turn 13, taking off his right front wheel. Ricciardo ended the session 0.201 seconds quicker than Verstappen, with Vettel only 0.085secs further back. The Ferrari of Raikkonen, who ran wide into a run-off area and had to spin-turn his car back on to the track, was fourth quickest, 0.775secs off the pace, ahead of Renault’s Nico Hulkenberg and Hamilton. Renault’s Carlos Sainz, Bottas, Leclerc and the Haas of Romain Grosjean completed the top 10. The first session at Singapore is traditionally not that representative of true competitiveness as it is run in daylight, while the second session takes place after nightfall at a similar time to qualifying and the race. Who will master the Marina Bay street circuit?